Early fall has arrived in Sweden. The nights are cool, and the days struggle to reach 70°F (21°C). A sure sign of the change in seasons is the appearance of lingon (LING-ohn) at local markets, and even supermarkets. Lingonberries, as they are most commonly known in English, are native to Scandinavia and have a long-standing history in Scandinavian cuisine. They may be most well-known as an accompaniment to Swedish meatballs, and lingonberry preserves (lingonsylt) can be purchased at any IKEA, or some specialty markets. 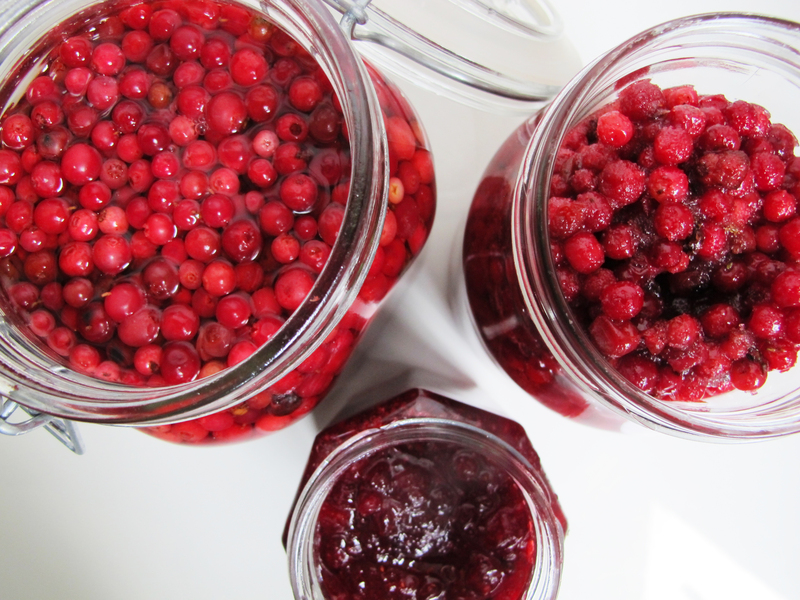 If you can find fresh or frozen lingonberries, making your own preserves couldn’t be easier. In fact, there are three easy ways to prepare fresh lingonberries, and it takes less than 30 minutes to complete all three of them at once. 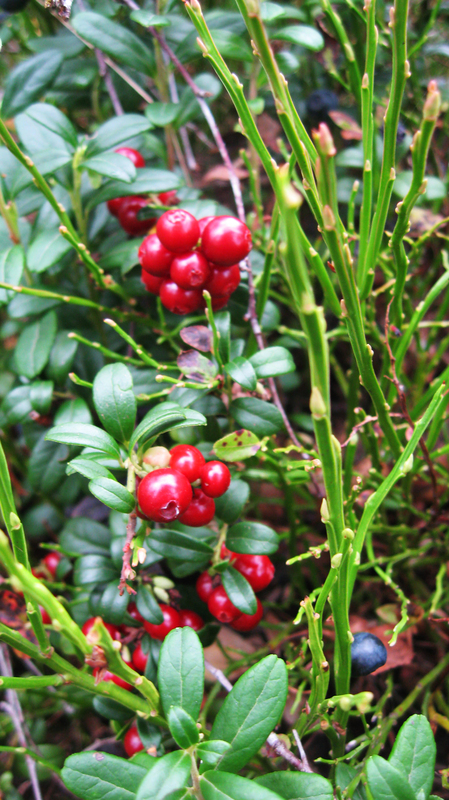 Known by many names (cowberries, red whortle berries, foxberries, northern mountain cranberries, dry ground cranberries, rock cranberries, partridge berries, wolf berries, or whimberries), the low-growing, semi-evergreen plants are native to Scandinavia. Lingonberries are grown commercially in Sweden, but can be found growing wild throughout the country from berry forests in the south up to areas of the arctic regions. Related to cranberries, blueberries, and billberries, lingonberries are ripe in Sweden from August – September and can often be found growing alongside wild blueberries. They have been identified as a superfood with antioxidant and antibiotic properties. High levels of benzoic acid provide a long shelf-life for the berries which made them an important food source historically. Fresh berries can be refrigerated for 8-12 weeks or frozen for multiple years. 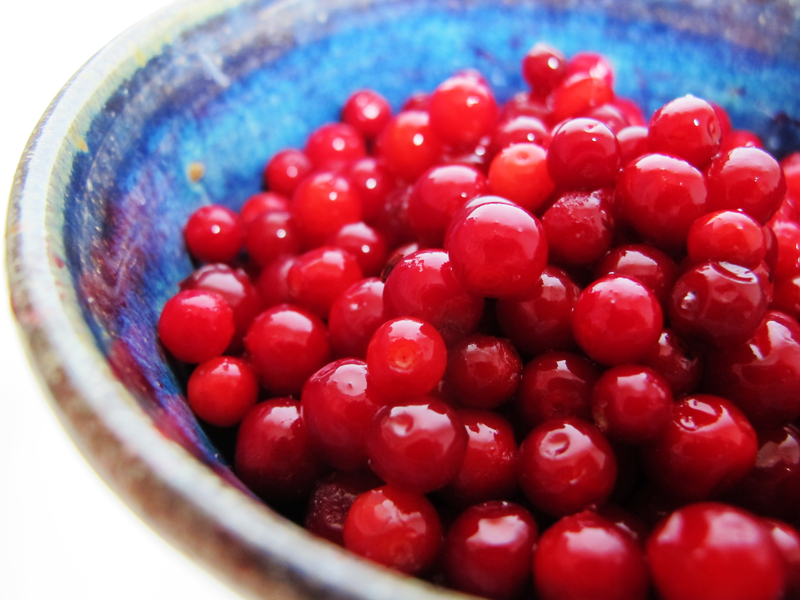 Lingonberries can be used raw or cooked in a variety of ways including preserves, stirred into sauces, breads, drinks and smoothies, baked goods, and desserts. As an accompaniment to food, they pair well with game, poultry, and pork. I purchased 2 kg (4.4 lbs.) of lingonberries for 80sek (about $2.25/lb) and within 30 minutes of rinsing and picking over of the berries completed the following three simple, classic preparations. The simplest preparation is vattenlingon (VAH-tehn-LING-ohn). Simply fill a clean glass jar with rinsed, fresh lingonerries, pour boiling water to cover them, and close up the jar. Once cool, refrigerate. This is the no-cook version of preserves. To make råröda lingon (ROHR-rud-uh LING-ohn) combine fresh lingonberries with sugar, stir them until the sugar dissolves, and let sit at room temperature for one hour. Place in clean glass jars and store in the refrigerator for up to three months. A classic ratio of sugar to berries is 1kg (2.2lbs) to 600g sugar (3 cups) sugar, but you can use as little as 300g (1 1/2 cups). The more sugar added, the higher the preserving qualities. Start out with a conservative amount and keep adding to your own taste. Råröda lingon can be prepared with frozen berries that have been thawed. Lingonberries contain high amounts of natural pectin. All you need to make lingonsylt (LING-ohn-silt) is lingonberries, sugar, and water to make preserves that will far surpass anything you can buy in a store. Combine 1 kg rinsed and picked over lingonberries (2.2 lbs), 240ml water (1 cup), and up to 500g (2 1/2 cups) of sugar to make approximately 1 liter (4 cups) of preserves. Bring everything to a boil and cook for 15 minutes. Remove any scum from the surface and place the preserves in clean glass jars. Seal and refrigerate. If you are lucky enough to live in a place where fresh lingonberries are readily available, it’s a dream to pick them in a misty Swedish forest surrounded by silence. For those who don’t have the time or inclination to forage themselves, it’s worth the minimal effort to buy a kilo of them and whip up one or more of these easy preparations to enjoy throughout the fall and winter. They are the quintessential accompaniment to Swedish foods and you may be surprised how versatile they are. If you are wondering what on earth you will do with all of this vattenlingon, råröda lingon, and lingonsylt I’m coaxing you to prepare, stay tuned. I’ll be working on going through my own stash and will share the best of the best and some Swedish classics along the way. Thank you for the Lingon Sylt recipe. Thankfully the Lingonberry grows circumpolar so we can enjoy them freshly picked here in Alaska. Thank you Scandinavia for showing us what to do with this wonderful berry. Just made a batch of Lingon Sylt. This is a no fail recipe. No pectin necessary and a perfect set! So glad you enjoyed the recipe. Picking wild lingo berries is a great. Enjoy! Thank you Ray Hafen! We in Mongolia also have wild lingonberries. Will try Lingon Sylt Mongolian style. Thank you for the Lingon Sylt recipe. too. We have in Mongolia also wild lingonerries. Didnt know what to do as well. When I was growing up in Finland they also had Puolukka survos, raw lingonberries and sugar were mashed together and stored in containers in cold, it was either served as is with meat dishes and casseroles or used to make soups or porridges. Hi! I am wondering if there is a way to ripen lingonberries after picking if they are not fully ripe? I did a quick search, and didn’t see anything about a way to ripen them once they have been picked, but did see one post where someone suggested the best lingonberry preserves are made with a blend of berries that are bright red, a bit pink and even some that have some white on them.